I have never been a big fan of TV shows. And when I like them, it is usually comedies. And I’m not talking about ‘Friends’ here. I like the more gross, taboo, demented, edgy stuff like ‘South Park’. So what is it like to see Cartman and Kyle battle it out in live action? 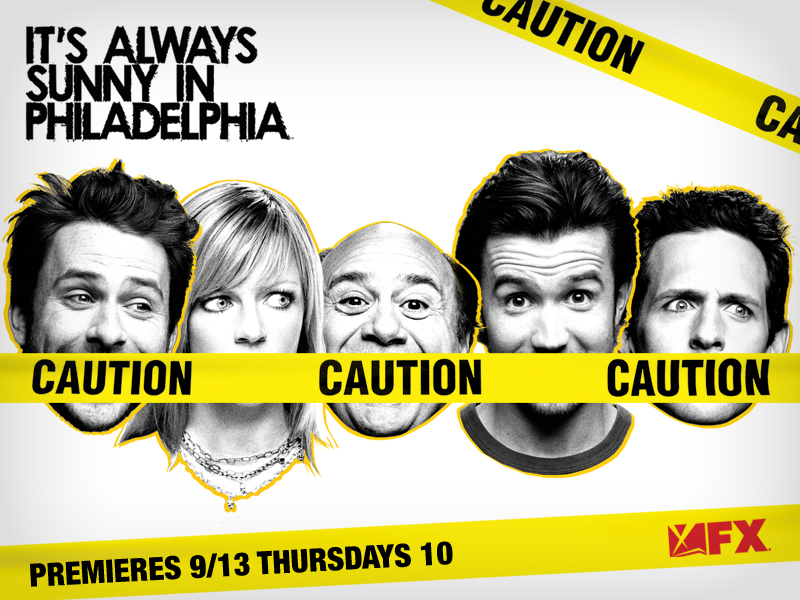 Well that exactly is ‘Its always sunny in Philadelphia’ for you. I had read about this particular show on forum and decided to check it out. I downloaded an episode from the fourth season and it was funny as hell. The tagline for the show is ‘It’s Seinfeld on crack’ and I can guarantee you that it truly lives to its reputation. I’m done with the irst two seasons and I’m absolutely addicted to this insane masterpiece. Just like ‘South Park’, Sunny was also piloted as a low-budget handy cam quality project with a budget of less than $200. After knocking the doors of the big networks, the show was finally picked up by FX network, skyrocketing their TRPs. The show is set in an Irish pub in Philadelphia (The word ‘Irish’ was enough to get me addicted to this) and is about its owners. Dennis Reynolds, is a narcisstic loser with a high dosage of superiority complex. Deandra ‘Sweet Dee’ Reynolds, his sister, is on her eternal quest to “prove women are equal to men”. Charlie Kelly is an underachiever who does his best to woo the Waitress across the street. Mac is Charlie’s childhood friend and coming from a broken home, his only goal is acceptance. Then there is Frank Reynolds, Dennis’ and Dee’s dad, played by Danny DeVito who joined in the scond season. These 5 make up the co-owners of the pub and are always ina bid to out-do each other. The only thing that the guys are bothered about is somehow getting laid, through hook or crook and in the process getting in trouble almost inevitably. There is also the Waitress (whose name is never revealed as of the 2nd season) who is the subject of Charlie’s constant attention although it is Dennis who mostly scores her. The episodes usually follows the gang’s exploits at making the most out of others’ miseries. All the members of the gang are self centered bastards only bothered about their own financial gain. They are never united and each person is more than ready to dump the other for their own small personal benefits. The characters are played by the makers of the show themselves. It was Charlie Day, Glenn Howerton and Rob McElhenney who plays Charlie, Dennis and Mac respectively who shot he initial piolt on a digital camcorder before FX ordererd for the first season. The show started telecasting in August 2005 and so far 4 seasons have been completed, with the 5th just started. For all those in India, if you are part of that civilization which hasn’t mastered the craft of torrents, I guess you can catch it on Star World. Don’t ask me about timings. I’ve more or less ditched the idiot box. This movie released in January this year and here I am writing a review in June. Now this is something I really regret. I should have been watching this marvellous film relaxing on a posh seat in Sathyam or Inox rather than in my dingy room on my ancient computer. First time director Zoya Akhtar delves behind the glitter and glamour of Bollywood, or rather as the ever lovely Dimple prefers it ‘Hindi Cinema’, and gives us a bold, yet masalaish outlook of the industry. It doesn’t take a genius to know that when it comes to Indian cinema, there is lot more than what you see or what you read in the tabloids. Om Shanti Om was the last film to poke fun at the industry. RGV attempted it with Rangeela before that. Whereas the former dealt with the subject in a rather humerous manner, the latter was more of the hard-hitting category. 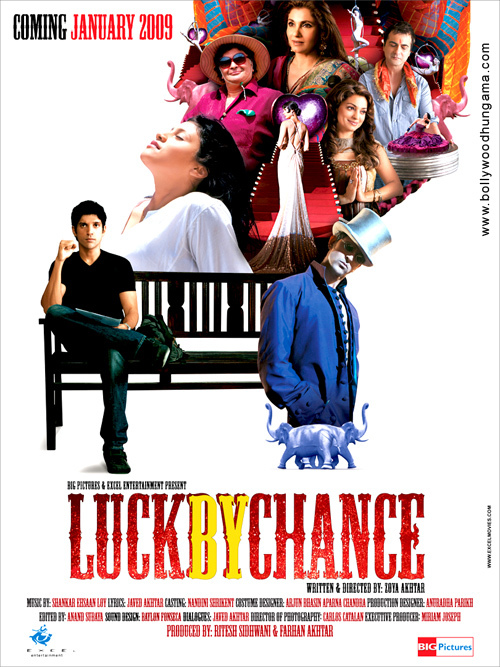 Luck by Chance, on the other hand has the same old cliches told in a refreshing new manner. For example, unlike her cousin Farah Khan’s OSO, Zoya Akhtar has been careful in not going over the top. The movie tells the story of young Vikram Jaisingh (Farhan Akhtar), who has come down to Bombay from Delhi to see his Bollywood dreams achieved. He meets and slowly develops a romance with Sona Mishra (Konkona Sen-Sharma), a struggling actress who belives someday she too will touch the heights of fame. While Vikram spends time honing his acting skills at a school, Sona is left with no choice but to act bit parts in B-grade movies. Sathish Chowdhury (Ally Khan) a small-time producer takes advantage of her predicament and promises her a ‘big’ role in the future. Meanwhile Vikram unexpectadly manages to bag the lead role in big shot producer Romy Rolly’s (Rishi Kapoor) latest venture after superstar Zafar Khan (Hrithik Roshan) ditches him for Karan Johar’s sure-shot next. The film also acts as a launchpad for Nikki Walia (Isha Sharwani) , the daughter of yesteryear heart-throb Neena (Dimple Kapadia). Conversely on the same day, Sona’s dreams are crushed when Chowdhury shows his true colors and and is left in the lurch. The rest of the film follows Vikram’s life as the new kid on the block and whether success gets into his head and affects his relationship with the ‘lowly’ Sona. The opening credits itself, a montage depicting the hard-work put in by everybody involved in any film, from the caterers to the extras, the light-boys to the set builders, the taliors to the fashion designers, is enough to create a lasting impression of the flick. What makes this movie different from other similar ones like OSO, is that although it digs into the filthy secrets of the industry, it does so in a subtle manner without ‘offending’ anybody. It is not easy to please everone, but Zoya has managed to even please even those at whom she takes a dig at. Writer and lyricist Javed Akhtar has complimented daughter Zoya well. With a strong script and simple, yet hard dialogues, Javed saab has once again proved he is one of the best around. I had never heard of cinematographer Carlos Catalan before this, but his work here is truly exceptional. You almost feel like you’re in the midst of Farhan and others. The soundtrack may not be anything outstanding, the trio of Shankar, Ehsaan and Loy have sure come up with some good tracks. I especially liked the folk sounding Baawre song. Zoya Akhtar is the daughter of such stalwarts like Javed Akhtar and Honey Irani. Not to mention Farhan is her brother and the beautiful Shabana Azmi is her step-mom. Coming from a typical filmy family, she perfectly understands what goes on behind the scenes. Her past experience as a casting director has well paid of in this flick. After Rock on, Farhan has put up another mindblowing, yet effortless performance as the protoganist. This being just his second film as an actor, he has the right expressions and simplicity of a new-comer, something that the rags-to-riches role demanded. Konkona meanwhile is in a class of her own. Her ‘unbollywoodish’ face perfects fits the bill of the actress struggling for a break. Sona is one character that deserves to be placed next to that of her award-winning character from Mr and Mrs Iyer. I would have loved to see Rishi and Dimple once again as love birds, but their respective roles more than make up for it. Dimple especially deserves a special mention as her’s is a role that echoes that of many former Bollywood starlets. Isha Sharwani may have gone unnoticed among the other major roles, but her character of the star-kid with zero acting skills is indeed special. After all, to act like someone who can’t get even the most basic dialogues right is no easy task. Her character is one of my favorite in the film. All the others including Hrithik in an extended cameo are realistic and translates one cliche or the other. Apart from Hrithik, the film also features cameos from stars like Aamir Khan, Abhishek Bachachan, Akshaye Khanna, John Abraham, Rani Mukerji, Kareena Kapoor, Shabana Azmi, Ranbir Kapoor, Vivek Oberoi, Dia Mirza, Ronit Roy and also others such as Karan Johar, Rajkumar Hirani, Javed Akhtar, Mac Mohan, Manish Malhotra and Anurag Kashyap all of whom play themselves. The script did require the cameos. But even if it didn’t I’m now sure Zoya is someone who is capable of pulling it off even without the presence of A-listers. If at all, there is any regret (if i can call it that way), it is the length of the film. We are talking about Hollywood and crossovers and here we have 2.5 hours. But other than that, there is not a speck of lifelessness in it. On the whole, I loved the movie and is a must watch, especially for those who don’t mind knocking the doors of the studio chaiwalla for a role. With Luck by Chance Zoya Akhtar has managed to carve a niche for herself.